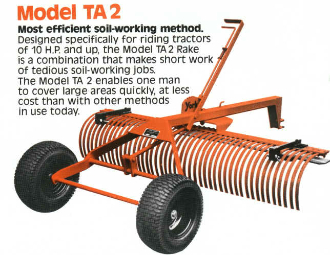 Model 2215 TA25 tow behind landscape rake 5 ft. wide. Has adjustable trailing hitch with pin type connection. Rake weigh is 217 lbs. and ships by truck. Photo shows OPTIONAL grader blade assembly attached.